Wow, this took a while. 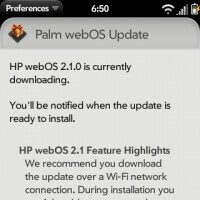 Unlocked Palm Pre 2 devices got their webOS 2.1 update in early March. And it's taken a ridiculously long time for it to come to Verizon's CDMA Pre 2. But alas, maybe we should just be grateful that it came at all, considering the Palm/HP transition? We're done ranting; it's time to rave. The webOS 2.1 update, which is being pushed out in a piecemeal fashion, brings a lot of fantastic features. One fun addition is Exhibition, which allows you to set specific display functions when your device is being charged. You can choose from a clock display, a slideshow of your photos, or your daily agenda. Next is voice dialing, which is prompted by holding down the volume key, or by long-pressing the phone dialing pad. Voice dialing doesn't seem like much, but if you got accustomed to it on your previous device, it can be sorely missed. WebOS 2.1 also adds text messaging backup, and support for Bluetooth keyboards. We think the physical keypad is pretty terrific on its own, but it's nice to have the option. There are also a number of bug fixes pertaining to email threads, photo thumbnails, messaging, task searches, and security. Now, where is Sprint's Pre 2 update? Im sure the 5 people who have this phone are excited.